Grundfos was the first client of Develco and has been a partner for more than 20 years. Grundfos has approached Develco in order to develop a smart device to communicate with their new Alpha 3 pump during the balancing process. The result of the new solution (including the Alpha 3 pump, Alpha Reader and the app) is a fast and easy system for hydronic balancing, offering easy installation, reliability and accurate data. 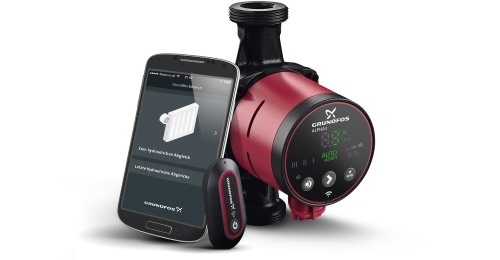 Grundfos introduced their new Alpha 3 pump and had an idea to revolutionize the method for hydronic balancing of the radiator and circulation pump. 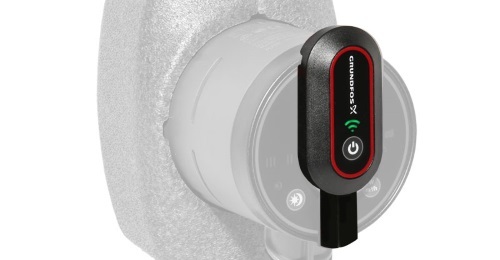 In order to reliably monitor the hydronic balancing process, a wireless device was needed. Thus, Develco was responsible for the development and production start-up of the new wireless device for Grundfos’ latest pump. Develco had 7 months in order to transform the idea into an innovative product that was ready for launch and that met the requirements of a sleek design, long battery lifetime and exceptional radio performance. Develco developed Bluetooth dongle, called MI401 ALPHA Reader, which is communicating with the app Grundfos GO Balance. The Alpha Reader is attached to the front of the pump which allows the reading of light signals from the pump and sends the data to the app. The Alpha Reader communicates via Bluetooth Low Energy. This solution was chosen, as it provides a long battery life, easy connection to any type of smartphone and eliminates the problem of signal range. Develco was in charge of all phases in the Alpha Reader development process and also took care of a production, choosing GPV Asia as the EMS provider. Develco took responsibility of all the development and production start-up of the Alpha Reader and met the stated time requirements. Therefore, Grundfos was ready to launch their new balancing system on time. Together with the Alpha Reader, balancing of the heating system becomes much easier, more accurate and reliable.